The state of Colorado has many colors and is often called “Colorful Colorado“. The very name (taken from the river that springs up in the western part of the state) is Spanish for the color red or reddish, which is the color of the water in the Colorado river, coming from particles of the red sandstone that is part of the state’s geological heritage. But more than anything else, Colorado is known for gold. The gold dug out of the mountains that brought Caucasians and their culture first to Colorado and that kick-started its economy, yes. But the gold that Colorado is famed for now is the gold of autumn in the high country, the gold of the turning leaves of aspen, their final glory each year before the leaves fall and winter sets in. On Saturday, I took a drive/hike/walk in Rocky Mountain National Park to see the color (that’s what we call it around here, “going to see the color”). And with just a few comments, I’ll mostly let these photos speak for themselves. 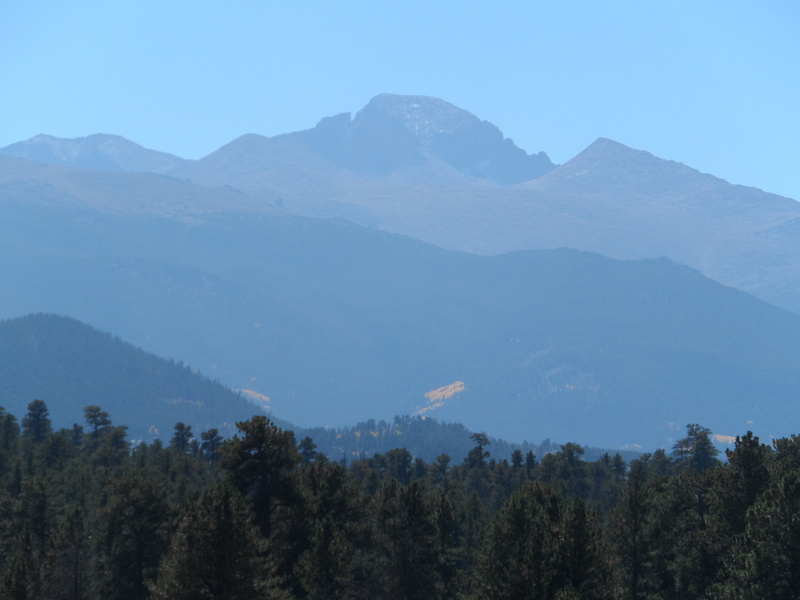 My special mountain, Long’s Peak, but look at the patches of gold on its lower flanks. Those are aspen. Aspen have some unusual, even fascinating facts, information to share. For one thing, a grove of aspen does not consist of separate trees, but of one organism connected via a root system and appearing to be individual trees. Aspen are a member of the birch family of trees, with paperwhite bark and heart-shaped leaves. These leaves are attached to the twig in such a way that each individual leaf quivers in the slightest breeze — so much so that the tree is often called a “quivering aspen”. Aspen are first growth trees. In areas of land with very poor soil or little topsoil, or land that has been burnt over or clear cut, the first trees that will grow on such land are the aspen. They will seed themselves after scrub oak and other lower, ground-covering bushes and plants, and will help to prepare the soil over time for the more needy pines that, in our part of the world, are considered the “mature” forest. So, in a sense, aspen are placeholders, but such beautiful placeholders. 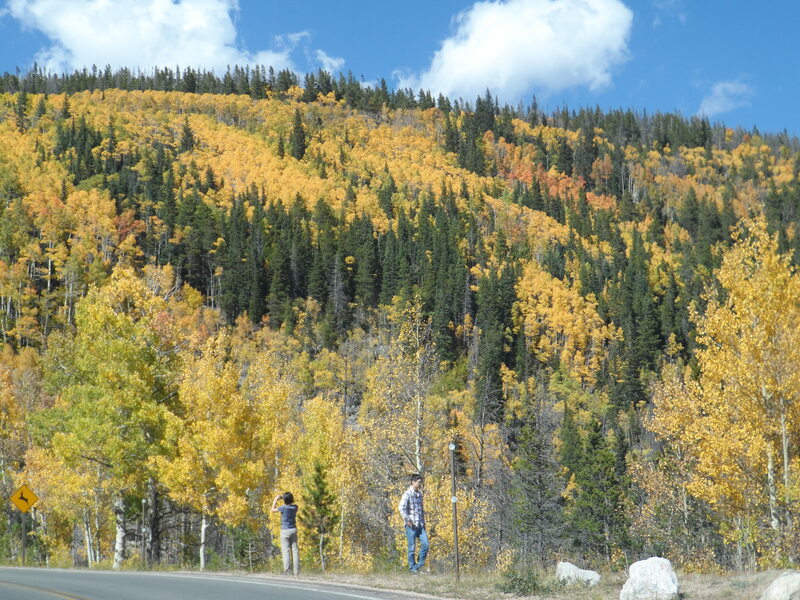 Mostly, during fall weather, when temperatures get low enough, the aspen turn gold, with some trees for reasons that are unclear, at least to me, turning orange, rusts or even nearly red. Just above, a small grove of aspen, a photo of which I took out of my car window (no pullouts in which to park) while moving, thus the slight blur. Please notice the white trunks with black areas. Those black areas are wounds to the bark usually made by elk and deer polishing their antlers. 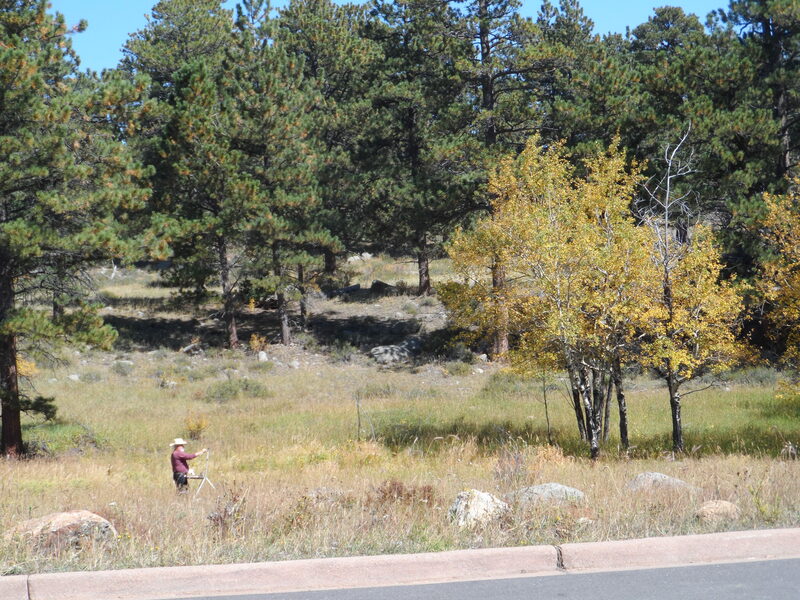 I didn’t want to disturb the gentleman, so I don’t have a point of view shot of what he was looking at, but the artist is out on a glorious fall day to capture in paint an impression of the aspen in gold, the pines in dark green, and the sky in a blue so rich royalty would be jealous. The brownish areas at the base of the pine branches are last year’s needles waiting for winter winds to pull them off the branches. 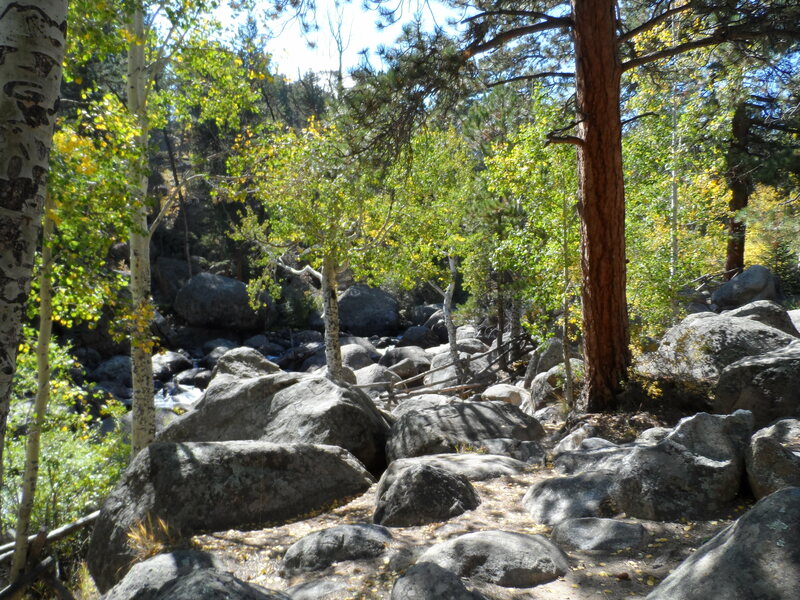 These pines are Ponderosas and are considered to be the primary mature trees in these mountains. In California, that pride of place would be Sequoias, of course, and live oak. Interestingly, the Ponderosa is a fairly short-lived tree, with an old specimen dating back probably only 150 years or so. This picture was taken along the road to Bear Lake, and we’ll continue to travel on that road for our next shots. 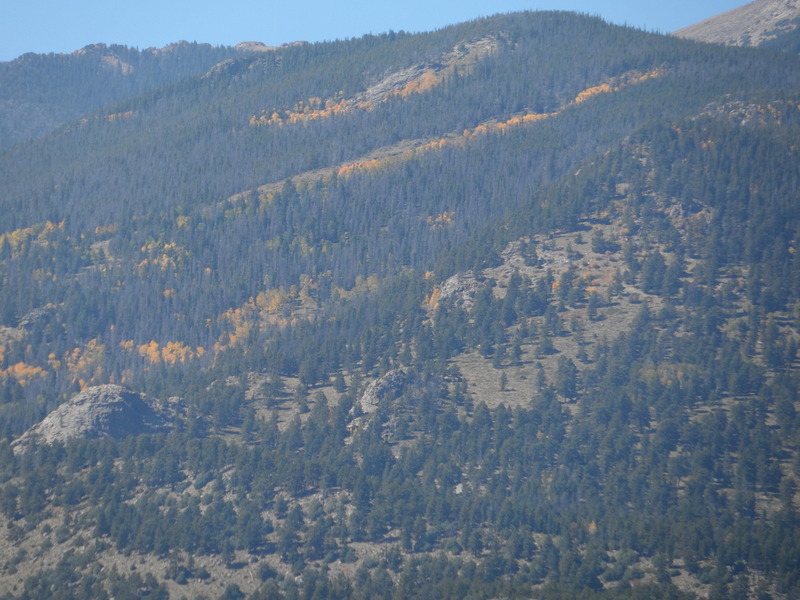 A closer shot of aspen gold intermixed into a Ponderosa forest on the side of a lower mountain. I should know the name of this mountain (all peaks in the Rocky Mountains have names) but I don’t. Otherwise, I would really sound like a ranger leading a nature hike (except for the out of breath part). Rocky Mountain National Park is truly Colorado’s big back yard. It’s not the largest national park at over 400 square miles (the largest is Yellowstone, I believe), but it isn’t tiny. It has roads only through a very small portion of the park. 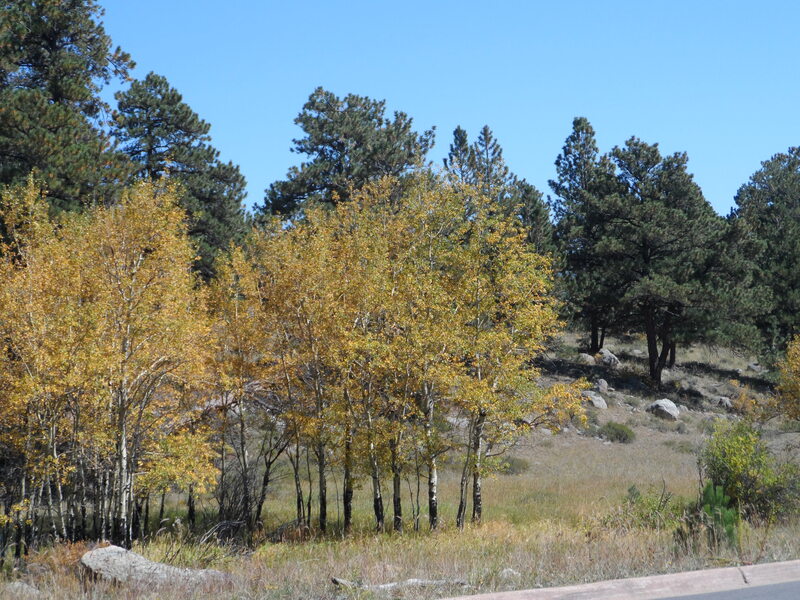 When Estes Park locals talk about taking a drive around the park, they mean a circle drive that takes in only a fraction of the park’s area, let alone its beauty. A fairly significant part of the park has been designated wilderness, and even hiking is prohibited with special permits. The park is home to numerous species of wildlife, of which the birds include owls, hawks and eagles as well as smaller birds such as Stellar jays, camp robbers, magpies and many smaller species. The mammals are just as varied, going up in size from chipmunks and voles to mountain lions and black bears (so far as I know, the park has no grizzly bears). The park is also home to huge herds of elk, bighorn sheep and deer. Moose seem to be moving in to the lower (and wetter areas) of the park as well. One species the park does not have, however, is the wolf. Reintroducing wolves into the park has been hugely controversial and, while I don’t want to dwell on it, apparently the powers that be would rather have rangers shoot superfluous or diseased elk rather than have a pack of wolves naturally reduce the numbers to the park’s carrying capacity. I would imagine that anybody reading this can guess on which side of the controversy I stand. Back to Bear Lake Road. Here’s a shot of a moraine along the road covered with gold. Moraines are the long piles of earth and rock left when a glacier recedes. Imagine the push of ice pressed down by more snow and ice on top. It spreads in a fan-like manner and as it moves ever farther downstream, it digs up rocks and soil and pushes them to the side. Then, aeons later, when the glacier recedes (as this glacier did long before any humans came to this part of the planet), it leaves the moraines on either side to mark its passage. A walk in the mountains this time of year is a symphony of color and smell. The air here smells of pine, of course, of dust, of rock, which has its own smell, and of the smaller and less spectacular plants that fill any sunny spot. Here is sage. Walking along, a person sometimes crushes a big of sage plant, and the heady, herbal aroma fills the head. 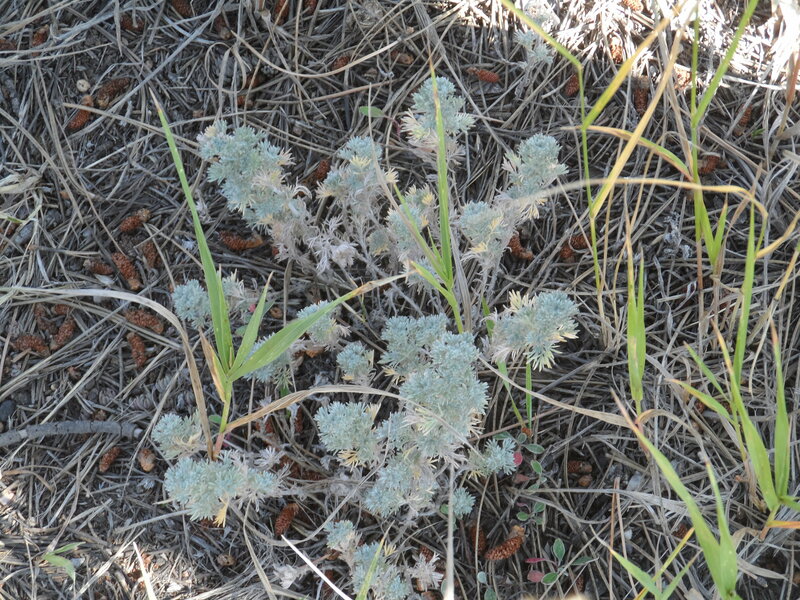 Sage is a blue-gray plant, not very big, and usually because of its aromatics, is left alone by plant-eating animals. Another shy, unobtrusive color is actually an animal itself. 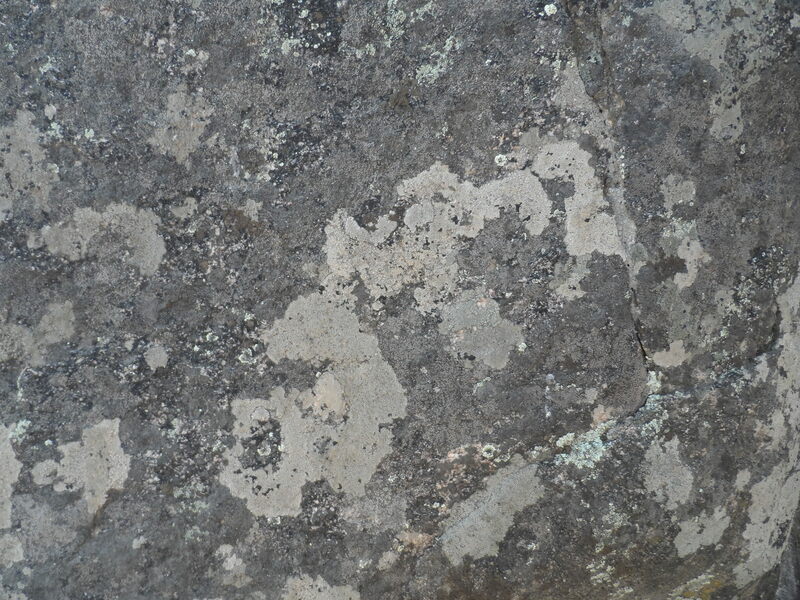 Lichen, which grows on and eventually, over thousands of years, breaks down into gravel or sand, the granite rocks that comprise the Rocky Mountains, comes in many different colors. Rocks with lichen growing on them are often call “moss rock” up here and are favorite wall and fireplace and deck stones. There’s a LOT of them because — well, this place is the Rocky Mountains, and that’s what’s underneath the thin layer of topsoil – solid rock. Lichen are akin to algae and other forms of life in that a particular piece of lichen is a colony of many thousands of individuals. Here’s a picture of a particularly lovely growth of lichen. And finally, there are the rivers that run through this beautiful space. Last fall (see my prior blog on the flooding if you like), gravity and rock and water combined to tear out roads and terrify the populace, but when the rivers recede behind their banks, you often can’t see much of the water. Here’s one of my favorite bits of the Big Thompson River as it runs under the bridge on the Bear Lake Road. The rocks that the water chuckles through and brilliantly illuminates in this gorge are especially beautiful to me and this photo doesn’t do them justice. The best view is right on the bridge and you’re not allowed to stop there, or walk across the bridge because it’s too narrow. Oh well, this is the best I could do. You can barely see the water in this photo, but it’s there towards the left. These trees, protected by the surrounding gorge and with plenty of water, are still mostly green. So that’s it, a mini-tour of Bear Lake Road (there were no parking slots available at Bear Lake, so the picture that ends this small essay is by somebody else at some other time, but the lake is (while small) so beautiful. 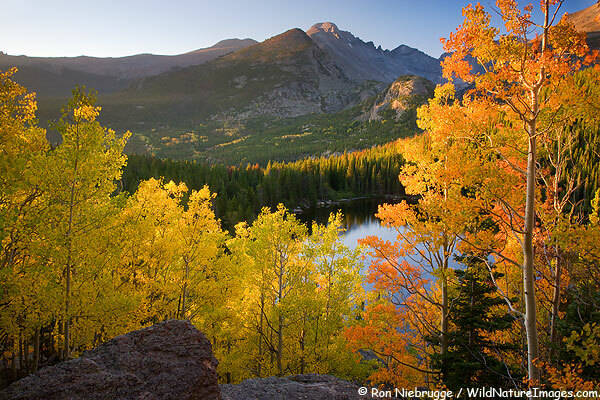 Autumn in the Rockies is a special time for Coloradans and those who visit us. Colorado has had many visitors and residents, and we came here for many reasons, but we all find autumn in the Rockies filled with the real gold of beauty, memory and nature.